One-and-a-half syndrome is a clinical disorder characterized by an ipsilateral conjugate horizontal gaze palsy (the "one") and an ipsilateral internuclear ophthalmoplegia (INO) (the "half"). The only remaining horizontal movement is contralateral abduction. The apparent adduction deficits can be overcome with convergence. This is caused by a lesion that affects the ipisilateral paramedian pontine reticular formation (PPRF) or the abducens (CN VI) nucleus (responsible for the horizontal gaze palsy) and the ipsilateral medial longitudinal fasciculus (MLF) (responsible for the INO - failed adduction of the ipsilateral eye). When this lesion also affects the fascicle of the the ipsilateral facial nerve (CN VII) in the region of the facial colliculus as it wraps around the CN VI nucleus, it produces a lower motor neuron pattern of ipsilateral facial weakness. When this occurs, a one-and-a-half syndrome plus a 7th nerve palsy, it is termed an eight-and-a-half syndrome. This patient showed signs of right facial weakness (forehead weakness, orbicularis weakness, ectropion, mouth droop). Along with a right horizontal gaze palsy that was not overcome with vestibulo-ocular reflex and an adduction deficit in the left eye. Adduction was preserved in both eyes with convergence. 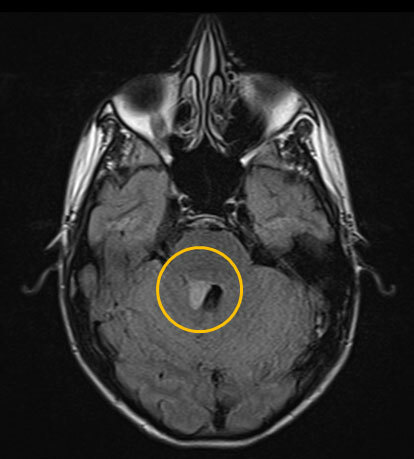 Imaging showed a pilocytic astrocytoma involving the brainstem tegmentum and extending into the fourth ventricle in the region of the right facial colliculus.